Note : This post is not the courtesy of INDEPENDENT NEWS COVERAGE PAKISTAN – INCPak but sharing with all due to its concern with the present politics, Hence it shows who’s defaming who and what sort of a hypocrisy going on behind the curtain and which tactics people are choosing to raise the finger, if the subjective post has truth in it, I am sure that Pakistani People would write in their comments meanwhile I am just posting it on Independent News Coverage Pakistan since we are determined , devoted and dedicated to our profession bringing the stories upfront which gets faded up somewhere in the history. It is your right to know since INCPak is the Voice of the People. Politics has a synonym in my country: nightmare, Pakistan is a land where majority of politicians are generally considered as devils; politics as nightmare. This truly is a general perception but even interesting fact is that our people are innocent enough to vote the very same politicians in every general elections, and that they hate non-democratic moves without knowing democracy and its basic theme. The concern is not to re-elect the same faces but to re-elect morally corrupt, disloyal-to-party and disloyal-to-nation politicians again, again and.. yet again. We have a long list of politicians on board and its the general public wish crash it. The list includes some runaway lovers like Altaf Hussain, some dictators demanding to be “democratic” President like Pervez Musharraf some smash hitters like Zulfiqar Mirza, businessmen and industrialists like Nawaz Sharif and honorable Mr. 10% Asif Ali Zardari. As stated earlier, the list is long and I won’t eat Blogspot’s bytes to state more names. The aforementioned list was altered 17 years back when a former cricket captain and world cup winner announced to initiate his political career. Imran Khan was the name and 1992’s world cup was the fame he tried to put in the dirty business of politics as his investment. Khan started the show by establishing a charity based Shaukat Khanam Memorial Hospital followed by creating a new political party, Pakistan Tehreek-e-Insaf politicians (PTI). Surety can not be guaranteed regarding the desired profit however till today, the highest democratic label of Pakistani Constitution is something doubted by general public as the dreamed goal of former sportsman. Khan, accelerated by the enthusiastic youth of Pakistan, is being portrayed by the same in conjunction with local media as new horizon on the skies of Pakistani Politics. Considering no emotional attachment to the former team leader, this blog will try to analyze the charismatic character and some important facts attributed to the quoted man usually ignored or deliberately rejected without any considerable reasons by the man himself and by the youth cheering behind him, following the band wagon. This blog will discuss 11 main facts PTI fans will either disagree without any counter reason or they will ignore just to follow a celebrity they want to appear on screen of national politics. 1. Support to Musharraf: Murdering Democracy? Imran Khan supported Musharraf’s 1999 coup adventure to turn the democratic table upside down starting dictatorship era in state. Captain also supported Musharraf’s referendum to prolong his presidency in the future. Musharraf is believed to be an egoist dictator who had thrown away an elected cabinet and imposed provisional government in the nation. It was first major action by Khan seen today as devastating to democracy. One can ask Khan’s followers or PTI but the answer would either be an ignore or responsive abusing in return. No matter how personal they try to prove such incidents, fact is that President Bill Clinton was forced for impeachment and public apology to the American nation, and the then US Senate. Improper sexual relationships are never a personal issue at any stage such as Khan’s. Imran Khan has never elected on any official rank in Pakistan. He has proved nothing practically other then a single Mianwali seat and a recent massive gathering of his followers with brilliant facilities like free transport to rally venue and free musical concert at prime location of Minar-e-Pakistan, Lahore. Even at this stage, Imran Khan is reluctant to speak about his previous mistakes publicly. Captain denied patronage to Tyrian Khan, that US Courts proved using the DNA tests. Any scandal exposed to media doesn’t remain personal anymore. Instead of apologizing his fans, Imran quoted it as his personal matter. Furthermore, his daughter still needs him as a father, something he denies but already proven. Try to put this confusion before any PTI fan and you will either be abused or amused by the follower. “When others were tired, they asked me to Imran Khan so that I may insist him to step into politics. I had over twenty five years relations with captain’s family but I was not sure if he would welcome me. He was a hero who used to meet with hundreds of people and liked to be linked, not with everyone though. I used to be free with almost all of his friends, 1996 autumn was however different. Although I was the first one who predicted in written that Khan will one day jump into the politics as business is not his passion whereas the possession of tremendous energetics would need some great grounds to be exhaled. Problem was however to initiate the discussion in a free environment. General Hamid Gul (may Allah bless him with good health and firm belief) asked me: “You are man of strong reasoning; nobody can stop someone from gaining respect if he continues to proceed on the path of honesty and truth. Tell this to him and he might get convinced”. General Hameed Gul is still considered as man of very strong links in defense circles. Now try asking this to a PTI follower and you might receive an interesting response. There was a time when Imran Khan was banned from entering in Sind. It was Musharref’s era with provincial government of MQM in Sind. It all started with Captain’s call to file a petition against MQM top figure Altaf Hussain. The motto was not clear but if it was to gain popularity among masses, it was well received no doubt. It made Khan as make up figure of city walls by MQM hardline workers. Karachi witnessed wall chalking of worse ethical fashion like “Imran Kutta (Imran dog)” and “Imran Zani (Imran Adulterer)”. The war of words also include some inclusion of Altaf’s married life in captain’s public word life. It all happened for a couple of months and then everything was over. Imran recently met with MQM leaders at their head quarters, Nine Zero. Khan was also greeted by the same (once a devil of PTI ideology), Altaf Hussain on his successful Lahore Rally. Question is, where did the opposition go? Is it like an Archaic among the vocabulary of PTI’s line of action? The Captain has been found contradicting his own statements on number of occasions, two of whom are worth sharing. PTI fans portray Khan as clean personality with nothing wrong or bad attributed. Khan had a clear stance over the so called Lotas (those who change their party loyalty): No place of already examined ones in PTI. News update delivered to my cell phone is that Mian Azher (Former president of PMLQ and political activist from PMLN very much active in Supreme Court attacks) has joined PTI. There are many other names to be included in the party pretty soon. Where did the fresh blood go? Is that what youth is asking for: Re-electing the old faces? Is that what Imran Khan promised for? Isn’t it contradiction to his own previous statements? Another contradiction is regarding Captain’s visit to Nine Zero. The details can be seen in this video clip, I believe most of the PTI members and fans will try to prove edited. Decision left upon readers if it is edited. 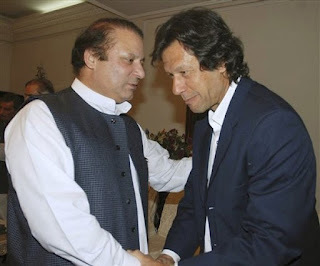 Imran is asking his proxy rival Nawaz Shareef, to ask for an open apology to the nation for all of his corruption. We ask Imran: Who will apologize for his own dirty deeds? An important question, that might drag you in trouble if its you versus PTI blind followers. Count me cynical, but the very reason of this artificial rivalry started by Imran Khan against Nawaz Shareef is not understandable in simple notion. According to the PTI members and Imran Khan himself, it is the corruption from PMLN as a main header for opposition to the party. Problem arises when PTI is unable to prove the corruption in the free and fair courts. PTI accepts independence of current judicial system, honorable Chief Justice of Pakistan and the honorable courts, yet reluctant to file the petition and follow it up on regular basis to prove what they claim. Nawaz Shareef is not Babar Awan whose punishment can be forgiven as a special provision provided to The President of Pakistan. He is no Rahman Malik to be given amnesty by Mr. Ten Percent. If its corruption alone, PTI should start shouting over other parties including ANP, MQM, PMLQ, APML etc. Many people will disagree with this but I believe Nawaz is not testified by the strongest media today. Most of the fan base youth of PTI just hates PMLN and Nawaz Shareef because Imran Khan says so. They can’t even answer this simple logical question: Why did Musharref let Nawaz go if he had proofs for his corruption? We know the enmity between Nawaz and Musharref. If Musharref was not able to prove anything, what grounds does Imran has to claim one? Imran on one side is initiating backdoor contacts with Pervez Musharref, PMLQ and MQM that are major stakeholders of corruption stories being unveiled by Supreme Court of Pakistan currently, whereas expanding their battle with PMLN on the other. This strategy convinces independent analysts even more about Khan’s links to Pakistan Army backed agency ISI, who still considers Nawaz Shareef as a nightmare throwing their Chiefs in a simple democratic manner. At the same time, Nawaz is avoiding Imran Khan and PTI to portray himself with no fear from the captain. Elections, approaching in coming year will clarify everything for sure, but the question is, is it fair to target a single party whose corruption is yet to be proved and to ignore others who are beneficiaries of the most wicked conspiracies like NRO? 9. Let’s accept Imran Khan: But wait… Where is The Team? Supposition can be visualized to see Imran Khan as truly honest man and call of the day but, where is his team? Politics is not a one man show as confirmed by Nuke Scientist Dr. Abdul Qadeer Khan. Its a whole team that must come into action to save a match and analogous to that, there must be a dedicated group of politicians who should eradicate the problems in the system and make it workable. Imran Khan presented ticket to His Highness Mr. Ijaz Ahmed Jazi, the famous scoundrel of the area who presented a voluminous 143 Votes as compared to 76980 votes to PMLN’s new face, Malik Shakil Awan (http://www2.ecp.gov.pk/vsite/ElectionResult/Search.aspx?constituency=NA&constituencyid=NA-55). While Imran was propagating the myth of youth attachment to PTI, it should be clarified that NA-55 is the posh area of Rawalpindi with majority of energetic youth as a part of voter base. Imran Khan still lacks the team. He can probably win all the seats of National Assembly of Pakistan, provided that he is the only candidate from PTI on each and every seat, but in case of people like Ijaz Ahmed Jazi, its a mere impossible to win any election. If Imran has to present Mian Azher or other Lotas, I question PTI members: Is this your Team? 10. Hide it – Win it: Who presented land for Shaukat Khanam? 11. Vote to PTI – Welcome to Zardari for Another 5 Years ! Sad but true. Its simple conclusion. Considering all over Pakistan, the two big rivals are PPP and PMLN. PTI is trying to detach votes from both sides. Reducing PMLN vote bank will ultimately facilitate PPP to come up, as PTI can not in any case steal out all the vote bank, or even major part of it. Accept it or not, the truth is as stated. PPP will not get rid of their vote bank as they grab it on Bhutto’s name. The post election scenario may invite Army to take over if no party gets considerable majority. Voting PTI will result in wellcoming Mr 10% for Another 5 year. P.S: This article is not intended to defame any specific party. Its just an analysis and agreement or disagreement of reader is warmly welcomed. Special Thanks to a good friend of mine, Haris Khan. It was all started with a single but powerful slogan: Change. Initial few years with Gen (R) Pasha resulted like a dream. Things however needed to be changed as PTI know they won’t be able to win elections with names like Ijaz Ahmed Jazi and Abrar ul Haq. This was the exact reason PTI introduced the Political Dhobi Ghat: A Place where old faces are used to provided with new identity. In an interview once, Khan informed the nation about taking NRO & Lal Masjid Operation in court. In contrary to this, Mr. Captain has welcomed Mr. Khurshid Mehmood Qusuri, one of the key players in Lal Masjid Operation & Afia Siddiqui Case are proud part of PTI today. Other identical examples can also be provided on request. 13. Dear PMLN: Resign though I won’t ! PTI has always demanded from PMLN to resign from their National Assembly & Provincial Assembly seats. The question is: When will PTI’s current MNAs are going to get themselves detached from NA seats? INCPak ~ It’s your right to know. what a stupid article. Nawaz Shareef has to apologize as he looted Pakistan’s money, as he was the prime minister. He looted people’s money!! Imran Khan is just being elected as the PM, he has no corruption charges. What he did in his personal life with women, that’s his own deeds. Do you think all the other Pakistani politicians didn’t have a colorful life or were not playboys.